Olga Kevelos, who for 26 years ran the Three Tuns pub in King’s Sutton with her brother Raymond and worked tirelessly for the parish council almost until her death just over three years ago, has been commemorated by classic wax jacket manufacturer Barbour. 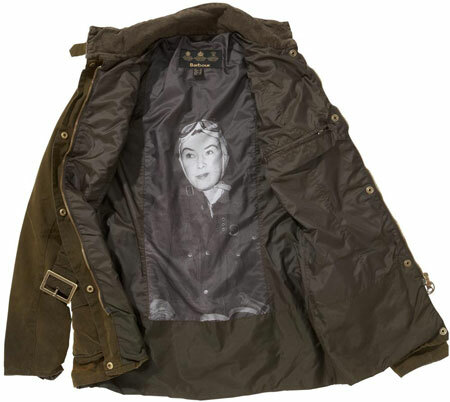 The company’s recently launched “Heritage International” waxed jacket – a snip at just £379.95 – features a photograph of Olga in the lining. The picture was taken when she was at the height of her illustrious motorcycle trials riding career. For those who don’t remember her, more details about Olga’s exceptional life can be found here. Besides competing in the International Six Day Trials events for 17 years on the trot, Olga also tried her hand at racing cars in the early 1950s. This Pathe News clip from 1950 is the only known film of this stage in her career. Sadly the gloriously patronising race commentator fails to mention that Olga led the race from start to finish, only being pipped at the post by another competitor because the mechanics in Olga's pits signalled her to slow down in case she blew up her engine!